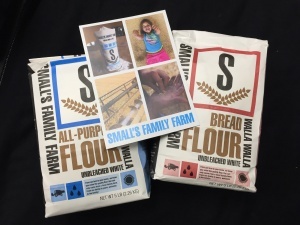 Merlino Foods is proud to stock Small’s Family Farm flours. Read the Small Family story below. Our family’s farming and milling heritage goes back as far as we can trace. Seven generations ago George Britton farmed and milled grain in Marion, Virginia. Five generations ago Agnes Britton and her brother moved west in search of new opportunities in farming. She settled in the Walla Walla Valley, married first generation farmer Ray Small Sr. and there began Small’s Family Farm. We have roots deep in the Walla Walla Valley and a strong commitment to sustainable farming practices that will ensure the future of family farming in our region. This is a family operation. We care for the land in a manner that reflects that the land is a member of the family. The land produces in a manner that reflects the way that we care for it. Family, farming, and quality products are all close to our hearts. From our farm to your home, we know you value the quality flour that can only come from a local family farm. From our family to yours, welcome to the family!